I am attempting to interpolate sediments across an area with data from 3 sources using ArcGIS 10.3. All three sources divide sediments into percentages of mud, sand or gravel. Two sources come from actual sediment cores where grain size was analyzed in the lab. The third comes from annotated photographs where a person estimates the % cover of each sediment type while viewing a photo of the seafloor. The annotated photographs are understandably much less precise than the grain size analysis. I have more data points from the annotated photos than the grain size analysis. All percentages were converted into decimals before using geostatistical analyst to interpolate using ordinary kriging. I will be repeating these steps for each sediment type (mud, sand, gravel). Is it more appropriate to combine all data points into one data set and krig together, or is it better to use co-kriging and add each data-set as a separate layer/variable? It seems like a gray area since the data are all either percent mud, sand or gravel but since some are collected with different methods, I could see using them as different variables. Esri provides a good explanation on Understanding Cokriging and things to consider if using this approach. Cokriging uses information on several variable types. 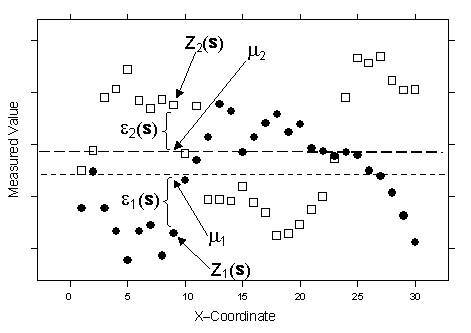 The main variable of interest is Z1, and both autocorrelation for Z1 and cross-correlations between Z1 and all other variable types are used to make better predictions. It is appealing to use information from other variables to help make predictions, but it comes at a price. Cokriging requires much more estimation, including estimating the autocorrelation for each variable as well as all cross-correlations. Theoretically, you can do no worse than kriging because if there is no cross-correlation, you can fall back on autocorrelation for Z1. However, each time you estimate unknown autocorrelation parameters, you introduce more variability, so the gains in precision of the predictions may not be worth the extra effort. For kriging, you associate some probability with your predictions; that is, the values are not perfectly predictable from a statistical model. Consider the example of a sample of measured nitrogen values in a field. Obviously, even with a large sample, you will not be able to predict the exact value of nitrogen at some unmeasured location. Therefore, you not only try to predict it, but you also assess the error of the prediction. So you need to consider which implementation fits best in your the approach and final results you hope to achieve. Choosing Cokriging you may find yourself adding more variability each time you estimate. Not the answer you're looking for? Browse other questions tagged arcgis-desktop point interpolation kriging geostatistical-analyst or ask your own question. Verifying time-invariance for spatial gradients of air pollution? How to interpolate percent coverage?